Preservation is cheaper than restoration. If you need proof, one place to look is the Beard’s Cove estuary-restoration project on Hood Canal, about a mile outside of Belfair. The project, nearing completion, is re-establishing 7.3 acres of saltwater wetlands by excavating and removing about 4,000 dumptruck loads of old fill dirt from an area originally built as a private park for the Beard’s Cove community. Belfair and Lynch Cove as depicted on a map created in 1884 by the U.S. Office of Coast Survey. 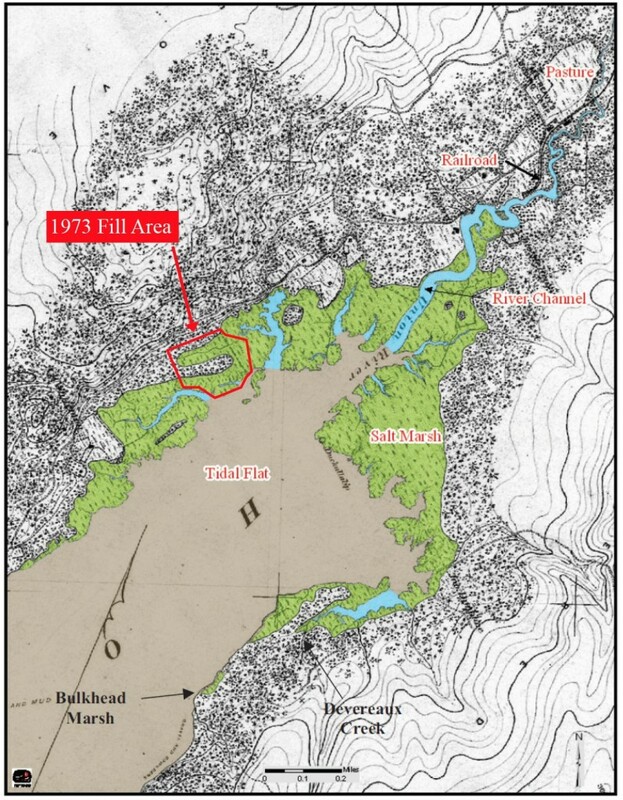 Colors were added, and the label “1973 fill area” shows the site of the current restoration. It is a rare restoration project, because essentially the same dirt used to fill the wetlands in 1973 is being taken out and put back where it came from — across North Shore Road from the development. The cost is estimated at $1.1 million, as reported by Arla Shephard in a story in the Kitsap Sun. Filling in the salt marsh was part of the development plan for the Beard’s Cove plat, approved by the Mason County commissioners a few years before construction began. The voter-approved Shoreline Management Act and other environmental regulations were just coming on the scene. Hood Canal Environmental Council, a fledgling group at the time, testified against the Beard’s Cove project. Phil Best, a young lawyer who would later become Kitsap County commissioner, was a founder of that organization. Although scientists today know much more about the value of estuaries, Phil said there was plenty of evidence at the time about the damage that would be caused by this kind of project. Much of the scientific information was provided by researchers at the University of Washington’s Big Beef Creek Research Station. That facility, near Seabeck in Kitsap County, is still used for salmon research. In the end, the Beard’s Cove developer prevailed with the county commissioners and the courts, and the fill was dumped into the estuary to create a park. Today, of course, a project like this would not even get off the drawing board. 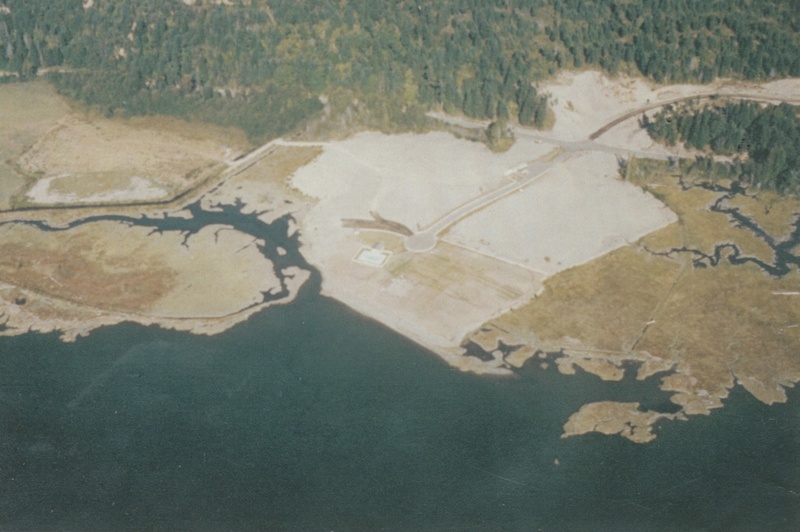 Aerial photo from 1973 during construction of the Beard’s Cove development, a portion of which was built on fill going out into Hood Canal. Image: Beard’s Cove restoration file. For every restoration project we know about, someone could have avoided the cost by not doing the damage in the first place. We must recognize that we are paying for many mistakes made by our forefathers. At the same time, we must face the fact that — despite all we have learned — we are still doing damage to the ecosystem. Some damage is inevitable, as more development is needed to accommodate a growing population. But we should be as careful as we can, so our descendants don’t have to undo what we have done. The alternative, of course, is far more dreadful. If we cannot turn the tide on our ecological destruction and find a way to live within the natural world, Puget Sound is doomed to ecological collapse. Future generations might live on a large, sterile pond and wonder what it once was like. They might as well live on the moon. The 540 or more families who live in the Beard’s Cove Community today had nothing to do with the mistakes that were made. Who could blame them for using the park and swimming pool developed for their use? People who grew up in Beard’s Cove cherish the memories of that park. I would suggest that it is of little value to blame anyone for past mistakes, since society as a whole sanctioned all sorts of activities that we would not allow today. The Beard’s Cove community should be congratulated for breaking with the past and allowing the restoration to take place. It may be true that the decision was easier after the park fell into disrepair. Someone apparently destroyed the old swimming pool by draining it during an extreme high tide, causing it to “float” up out of the ground — or so the story goes, says Louena “Louie” Yelverton, president of the Beard’s Cove Community Organization. Louie says the community supports the restoration of the marsh and looks forward to seeing a more natural shoreline. Louie credits Kate Kuhlman of Great Peninsula Conservancy for helping to generate goodwill in the community. Her concerns for the people as well as the steadfast promotion of the science helped get the project to construction. GPC coordinated the grants to get the work done with some land left for community use. The Beard’s Cove project, including a permanent conservation easement, fills in the final gap in a full 1.7 miles of unbroken estuarine habitat to be preserved in perpetuity, thanks to GPC and its North Mason predecessor, Hood Canal Land Trust, along with Pacific Northwest Salmon Center, Washington Department of Fish and Wildlife and the North Mason School District. The project includes the construction of 2,530 feet of newly formed tide channels, 1,200 feet of graveled beach and large woody debris habitat structures. Marsh areas like this are among the most productive places on the planet, supporting a rich food web that includes salmon species such as Puget Sound chinook, Puget Sound steelhead and Hood Canal summer chum, all listed as “threatened” on the Endangered Species List. Christopher Dunagan thank you for the wonderfully written article. There were some historical information I found very intriguing. Well done! Christopher: Thanks for this article. It correctly emphasizes the generous goodwill of the current members of the Beard’s Cove community. Also, I would like to give a personal thank you to Kate Kuhlman from Great Peninsula Conservancy for her patience and tireless efforts over the past few years to bring all the parties together to make this restoration happen. Great work!